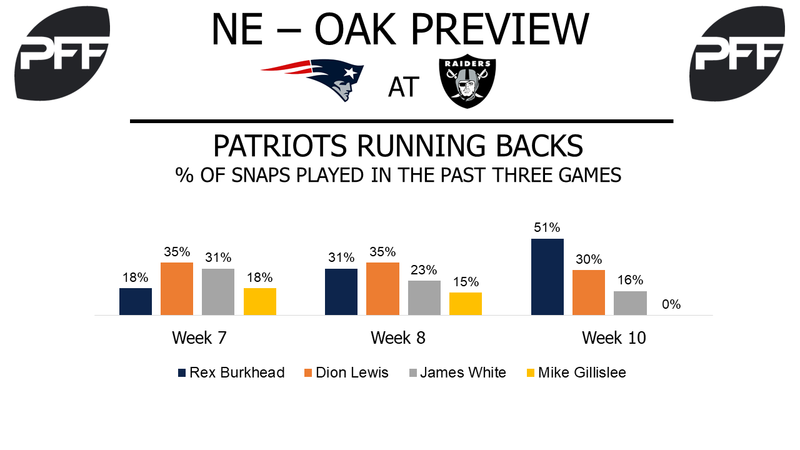 RB Rex Burkhead vs. LB NaVorro Bowman – Rex Burkhead has seen his snap total increase each week since he returned from injury in Week 7, and his 36 snaps in Week 10 were a season-high. His 72.6 overall grade is helped by his 82.6 receiving grade, and hindered by his 55.4 running grade. Burkhead’s injury has kept his usage in the passing game from meeting the 25 percent of team targets threshold, but among all running backs with at least 10 targets, his 2.82 yards per route run is the second-highest figure. He’ll often draw the coverage of Navorro Bowman when running and receiving, but it’s the latter matchup Burkhead could seek to exploit. Bowman’s 70.2 run-defense grade far exceeds his 43.2 coverage grade. He’s allowed receptions on 11 of his 13 targets in coverage, while his 8.9 run-stop percentage is tied for 13th among 56 linebackers with at least 138 run snaps. TE Rob Gronkowski vs. LB Cory James – Rob Gronkowski’s already played 186 more snaps this year than he did all of last season. He’s never earned an overall grade below 85.3 in his seven NFL seasons, and his 86.2 overall grade through 10 weeks suggests that he’ll maintain that distinction through eight seasons. His 2.16 yards per route run is the second-highest mark among 23 tight ends with at least 161 snaps in route, while his 100 pass blocking efficiency rating is the only perfect rating of 24 tight ends with at least 32 pass-blocking snaps. WR Brandin Cooks vs. CB Dexter McDonald – Brandin Cooks continues to excel in the New England offense, and his 78.4 overall grade is the highest of the Patriots’ wide receivers. He’s been exceptional on targets of 20-plus yards, with a 52.9 catch rate that’s seventh among 60 wide receivers with at least 18 deep targets. Cooks has lined up on the offense’s right side on 40 percent of his snaps, where he’ll often be covered by cornerback Dexter McDonald. McDonald has allowed a reception for every 7.5 snaps in coverage, which is tied for the seventh-lowest figure among 116 cornerbacks with at least 108 snaps in coverage. T Donald Penn vs. Edge Trey Flowers – After a holdout this preseason netted Penn a two-year contract extension, his play hasn’t been spectacular, but it is still solid. He is PFF’s 15th-ranked tackle this season after finishing 2016 ranked 12th. Penn has allowed three sacks and 14 total pressures in 331 pass-block snaps and is ranked 10th in PFF pass-blocking efficiency. Flowers is currently PFF’s 33rd-ranked edge defender with an 80.8 overall grade. He has three sacks and 36 total pressures in 295 pass-rush snaps this year. 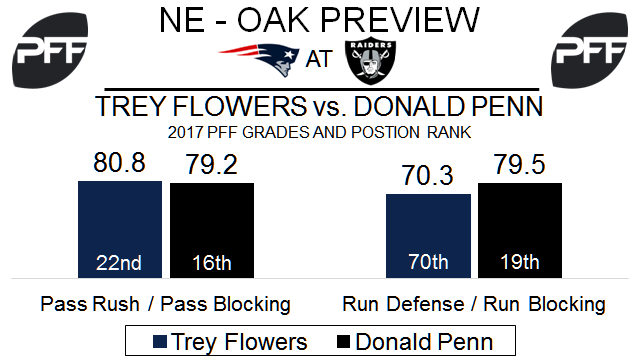 If Penn has any advantage in this matchup, it would be in the running game, where his 79.5 run-blocking grade is stronger than Flowers’ 70.3 run-defense grade. RB Marshawn Lynch vs. LB Elandon Roberts – Despite a brief retirement last year, Lynch is still a difficult ball carrier to bring to the ground. He has forced 19 missed tackles in 92 touches this season. Lynch is 11th among running backs with 3.08 yards after contact per attempt through Week 10. Roberts has become the Patriots best run stopper at linebacker, as he leads the unit with an 8.5 percent run-stop percentage. He has 11 run stops (plays graded as a “win” for the defense) in 130 snaps against the run, and ranks 39th of 90 qualifying linebackers in run-stop percentage. WR Amari Cooper vs. CB Malcolm Butler – The Raiders used Cooper in the slot on 32 percent of his routes in Weeks 7-9, so it will be interesting to see if the Patriots choose to have Butler shadow him this week. Cooper leads the team with 13 targets on deep passes (targets 20 or more yards downfield) this year. He has forced six missed tackles, which is tied for eleventh among receivers. After finishing 2016 as PFF’s seventh ranked cornerback with an 88.1 overall grade, Butler has slipped a bit this season. His 75.6 grade through Week 10 ranks 53rd at cornerback, and his 1.31 yards per cover snap ranks 78th of 116 qualifying cornerbacks.